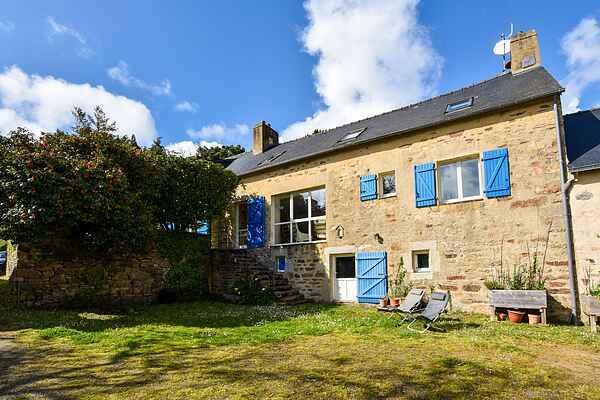 This characteristic Breton holiday house is located in the hamlet of Saint-Germain. The living room offers views over the River Laita , which flows 200 m from the house. You can take gorgeous walks starting right at the house and enjoy the beautiful flora and fauna. The children will love playing in the garden with a slide and a swing set, while you enjoy the sunshine. The owners, who sometimes stay in the house next door, are very discreet and respectful of your privacy. You can lounge on the beach at the seaside resort of Le Pouldu (6 km). Other local attractions include Pont-Aven (17 km), where well-known painter Gauguin painted some of his famous works, the medieval village of Concarneau (30 km) and Le Faouët with its 16th-century market square and the famous Sainte Barbe chapel (27 km). Children will enjoy the zoo in Pont-Scorff (20 km). A bakery, a zoo, a supermarket and restaurants are in Clohars-Carnoët. There's a 18-hole golf course in Lomener (20 km). Quimper (60 km) is highly recommended: the Cathedral of Saint-Corentin, the museum of Breton folk art, the Maison des Cariatides (the most beautiful house in Quimper) and a maze of picturesque alleys lined with potteries.